A powder keg at the table, former English 8-ball star "Dynamite" Darren Appleton has exploded onto the world pool scene. EVEN BEFORE he was out of his teens, Darren Appleton had established a scary reputation around Yorkshire, England, poolhalls, notorious not only for hitting such a dead gear he would barely miss a ball for hours but also, after losing matches, suddenly just going bonkers. His temper, even through his days as the No. 1 English 8-baller, was hellacious: His face would flush to where it virtually turned the shade of a snooker-ball red. He'd gnash his teeth seemingly down to the gums. And he'd assume the disposition of someone gripped by road rage, appearing as if he wanted to rip someone's throat out, if not take a slug with that powerful right hook that knocked out half-a-dozen amateur boxers. He'd snap cues in half like toothpicks. He'd grab balls off the felt and start flinging them. He'd ram his cue case into the floor. He'd slam doors, kick pool tables, punch walls. One of his friends, early on, came up with a nickname that likened the short-fused Appleton to a stick of TNT - Kid Dynamite - and the tag fit so perfectly it has stuck around all these years later. "Yes, I was easy to upset (in general) back then, especially if someone bad-mouthed me or my family, and I suppose I took that aggressiveness into my pool game," admits the 33-year-old Appleton. "I hated to lose at anything. It's weird, because my family is a lot more laid back, never really had any hard tempers at all, except for my brother Shane (another English 8-ball pro), who's a very bad loser, but not as bad as I am. "But I think, for all the silly things I've done because of my temper, it's what made me the player I am. It shows have lot of desire and heart and drive to win." Even if guys like fellow-countryman pro Raj Hundal, with his tongue in cheek, says: "Darren? Man, he's a crazy muthaf--ker, a seriously off-the-wall, insane-in-the-brain kinda dude." 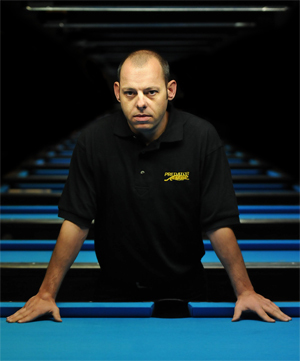 And his friend Karl Boyes, another Yorkshire-born pool pro, being similarly light-hearted, adds: "Darren's got problems. I remember once on the EuroTour, in Holland, he (got really ticked off after losing a match), saying it was because he had too much chili sauce on his kebab from the night before." Whether suffering from low frustration tolerance, ridiculously unreasonable expectations, or an uncontrollable wildfire burning up from deep in his genetic roots (if not all of the above), Appleton has gone, in what seems like a matter of heartbeats, from being a killer in the small-table, small-ball game of English 8-ball - accumulating a record 35 major titles - to being a killer in the very different realm of American pool. In 2008, two years after he was banned from the English 8-ball tour for making unabashedly harsh comments about the organizers, he let everyone in the pool world know he was someone to be taken seriously by snapping off the prestigious $100,000 World 10-Ball Championship. And in May of this year, proving the 10-ball thing wasn't a fluke, he scored a huge win at the World Pool Masters.